I-Codi Colors of the Wind boast as many as 50 shades of the wind. This is the only brand that offers huge variety in colors by ingenious amalgamation of multiple different hues. I-Codi takes pride in how all the models are creatively designed to blend against the different eye colors and that too without leaving any traces of fake impression. I-Codi Colors of the Wind No 35 Lavender make your eyes enchanting. The color blends neatly yet help you make a unique statement. On the other hand, I-Codi Colors of the Wind No 45 Sugar grey are a bit louder, darker & more noticeable. 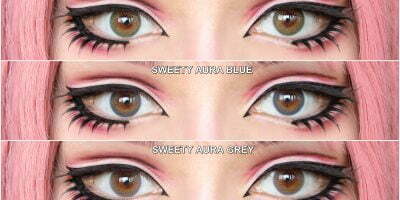 These may be your perfect choice for cosplay where you need to manipulate your original eye color to bluish grey.